House Speaker Paul Ryan holds a news conference to announce that the Republican Party has decided not to vote on its health bill on Friday. "We were close," he said, but the votes weren't there to pass it. House Republicans scrapped a vote on their health care replacement plan on Friday after defections from both the right and center that made it clear the bill would not pass. "Obamacare is the law of the land. It is going to remain the law of the land," House Speaker Paul Ryan admitted shortly after he pulled the bill. "We're going to be living with Obamacare for the foreseeable future. I don't know how long it's going to take us to replace this law." Ryan may have admitted defeat, but President Trump chalked it up to a "learning experience." Trump also tried to spin the setback as an opportunity for a potential "bipartisan" bill in the future. "Both parties can get together ... and have a better bill," he said, adding, "Having bipartisan would be a big, big improvement." But Trump and Ryan both said health care is being put on the shelf for the time being. They're moving on to tax reform. The failure of the health care bill is a major setback for Trump's leadership and Ryan's ability to control his conference. That control was something that eluded his predecessor, John Boehner, and eventually led to Boehner's ouster. "The best thing we can do politically speaking is let Obamacare explode," Trump argued in the Oval Office. "It is exploding right now." Trump — who is the first president to enter office without any political or legislative experience — seemed to admit there was a bit of a learning curve. "This was an interesting period of time," Trump said. "We all learned a lot. We learned a lot about loyalty and we learned a lot about the vote-getting process. And we learned about very arcane rules in both the Senate and the House. Certainly, for me, it was a very interesting experience, but for me, it'll be an experience that leads to an even better health care plan." 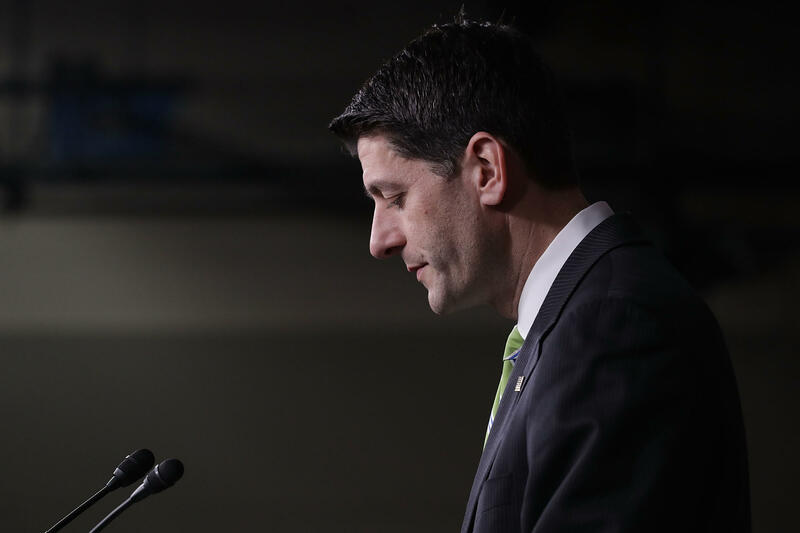 Striking a more solemn tone, a dejected Ryan admitted that fulfilling the GOP's pledge to repeal the Affordable Care Act was tougher than expected. "Moving from an opposition party to a governing party," Ryan said, "comes with growing pains, and, well, we're feeling those growing pains now." He added, "This is a setback — no two ways about it. ... I will not sugarcoat this — this is a disappointing day for us." The way forward for Republicans on exactly how to replace Obamacare remains murky. And it's not clear whether they will try again. Ryan had already delayed the bill a day to try to muster support. Trump had delivered an ultimatum to House Republicans — pass the GOP replacement, the American Health Care Act, or Obamacare will stand. Ultimately, the votes never came together for a fractured GOP caucus, and Ryan traveled to the White House to tell Trump he was pulling the bill. Democrats, meanwhile, were more than happy to take a victory lap in the GOP's defeat. House Minority Leader Nancy Pelosi, whose caucus was decimated in 2010 after the health care bill was passed, appeared flanked by Democratic leadership to gloat just a day after the seventh anniversary of the signing of the Affordable Care Act. "It's pretty exciting for us," the California Democrat said, beaming. "Yesterday the anniversary. Today is a victory for us." The inability of Republicans to reach consensus on a bill, given their control of the House, Senate and White House, badly hurts the GOP's image as a party that can govern, and Ryan admitted as much on Friday. The GOP has vowed repeatedly over the past eight years that it would repeal and replace Obamacare. The legislative stalemate endangers Trump's and the GOP's agenda and casts a cloud over the legislative path forward after an election waged almost entirely as the antithesis to a progressive agenda enacted by former President Barack Obama, Trump's predecessor. The risks were high for Trump on the bill. He has hyped a brand of someone able to strike the best deals. Being unable to get this through, after giving an ultimatum to congressional Republicans Thursday, raises questions about just how good a deal-maker he is and underscores his lack of legislative and policy experience upon entering the White House. Vice President Pence, who canceled a trip out of Washington, had hoped to make one last sale in a meeting with the roughly 40-member, hard-line conservative Freedom Caucus, which had also refused to budge from its ideological objections to the bill. In an attempt to win the caucus over, an amendment was added to the bill late Wednesday night, cutting essential health benefits, 10 types of medical care that insurance companies are required to cover. The Freedom Caucus wants to see premiums come down and believes cutting benefits is the way to do that. But that also had an effect on moderates. For example, Rep. Barbara Comstock, R-Va., who represents a swing district in the D.C. suburbs, said she wouldn't back the bill, joining more moderate Republicans who are top 2018 Democratic targets who don't want to take a tough vote that might come back to bite them during the midterms. Rep. David Joyce, R-Ohio, another centrist Republican, announced he wouldn't support the bill either, saying in a statement that the GOP's replacement plan was no better than Obamacare. And House Appropriations Committee Chairman Rodney Frelinghuysen, R-N.J., also broke ranks with GOP leadership on Friday, announcing that he was a no vote. His reasoning: The current bill adds too many new costs and barriers, along with taking away benefits requirements. White House press secretary Sean Spicer had maintained at his daily briefing that a vote was still slated for this afternoon. He said Trump had "left everything on the field" to try to woo Republican members, having contacted over 120 members. But his tone and tense were notable. Spicer wouldn't concede that the bill might fail, but he did admit that "at the end of the day, you can't force somebody to do something." He added, "At the end of the day, this isn't a dictatorship."